Saltaire is a Victorian era model village that illustrates the philanthropic approach to industrial management typical of this period. 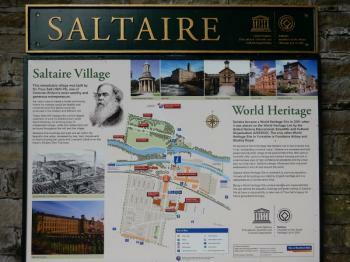 Saltaire was founded by Sir Titus Salt in 1853. The name of the village is a combination of the founder's surname with the name of the river Aire. Salt moved his entire business from Bradford to this site partly to provide better arrangements for his workers than could be had in Bradford and partly to site his large textile mill by a canal and a railway. Salt's philanthropic project is usually seen as an example of paternalism. Salt built neat stone houses for his workers, wash-houses with running water, bath-houses, a hospital, as well as an Institute for recreation and education, with a library, a reading room, a concert hall, billiard room, science laboratory and gymnasium. The village also provided a school for the children of the workers, almshouses, allotments, a park and a boathouse. Unfortunately this was another disappointing visit to an industrial town in the UK. I arrived in Saltaire on a sunny Sunday morning by train from Leeds, just 14 minutes away. The train station (though rebuilt) is right in the middle of the historic town, and across from the Salt Mill. So no time lost. But it provided me with the first difficulty: what would I go and see? I started with a short walk along the Leeds and Liverpool Canal. It has the best photo opportunities for both mills, and their impressive towers. As always the towpath is a fine route to walk, although the many passing cyclists made it look like I was walking in Holland again. I guess those English have all taken up cycling as a hobby since their fellow countryman won the Tour de France last year. The huge Salt Mill itself is the obvious next choice. It nowadays houses an exhibition of the work of the artist David Hockney and several shops. Somewhere at the back, behind the coffee shop, there is a “Saltaire History Exhibition”. Here I hoped to find at least some respect for what working in a textile factory meant during the 19th century, but what I found was 8 other visitors in front of a TV. Come on! In my opinion, having visited several industrial sites in the UK and abroad (Germany for example), the UK has some serious issues in how to present these sites. I can understand that the cost might be too high to maintain all of it, but renting them all out into the hands of commercial enterprises is a bad choice. There’s (inter)national heritage at stake here and that involves more than “just” keeping up the buildings, I don’t need another bookshop or one that sells kitchen utensils. The most interesting aspects of this WHS are its town plan and the housing conditions provided for the workers. At the lacklustre tourist information I asked for a walking route through this area, and was handed a sheet with a circular walk that I could have drawn myself too. No additional information is given about what you see during your walk, the differences between the housing types et cetera (which is explained in the WHS nomination document by the way). The core zone indeed is very much intact as it was built in the 19th century. Salt never could have imagined though that his workers each would own a car – so the streets are now littered with parked cars. March 2018 - After being in Yorck we came to the Leeds area. We passed Leeds and went straight to Saltaire. Small charming town with authentic workers accomadations and a nice factory to watch. We went through all floors of it and were pleased we did not have to pay anything. 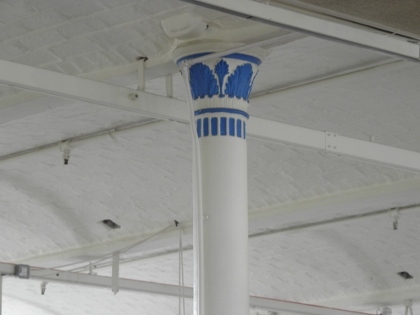 The shops in the factory are suiting the architecture well. We enjoyed the few hours here. But WHS, I do not really believe that this place was of that big importance to human history. 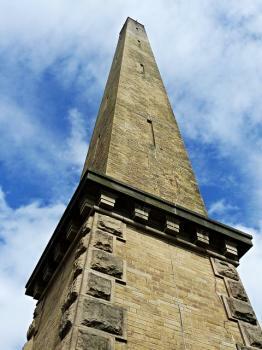 My wife and I visited Saltaire in June 2017, and given the frankly mixed experiences people seem to have at Industrial Revolution sites (and the disappointment we'd had at some sites particularly in the UK), Saltaire was surprisingly good. The mill itself is underwhelming (mostly inaccessible, and the available parts are given over to shops, cafes, galleries etc). There is a small display in one area of the mill talking about Saltaire and why it was important. But what I found fascinating was doing background research before our visit, so that I was already familiar with the ideas and concepts that were realised here in this small town, and how those ideas resonated around the world. The buildings are generally in good condition, and it's great to wander around the church, Victoria Hall, the school building, the hospital and of course the neat rows of streets, even on a wet and cold summer's day like us! 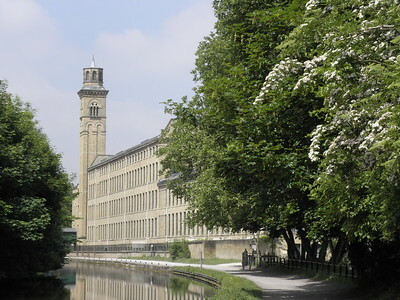 One of a whole bunch of industrial sites in the UK, Saltaire has the advantage of being just a 15-minute train ride from Leeds, and the station is right in the middle of the village. It is a pleasant place for a walk and some shopping, with a pretty church, a nice park along a small river, and a handful of historic buildings. I did not have a bad visit, it was just not very exciting - nice to do if you are in the area, but nothing really special. Probably worth the inscription because of its historic value, but today, the visitor experience is not so great (unless you happen to be a fan of local boy David Hockney, many of whose paintings are exhibited in the main building called Salt's Mill, which used to be the main textile mill and is now a combination of shopping mall, art gallery, and restaurant). I visited this WHS in June 2016. I had spent 2 weeks in Leeds around 6 years ago but I chose to miss out on the WHS nearby to visit York and Whitby instead. This time round I arrived in Manchester with an early flight and I decided to visit Yorkshire's WHS. Since I arrived before 10am, when all the shops in the mill open, I parked my car for free in one of the Victorian town's parking spaces just opposite the mill. You're allowed 3 hours no return which is more than enough for this WHS. I started my rounds by walking around the quaint town of Saltaire to see the workers' houses, Shipley College Salt Building, Victoria Hall and the United Reformed Church before heading towards Roberts Park for a stroll. Roberts Park is accessible via a small footbridge next to the new mill and a pleasant walk leads to Shipley Glen Tramway and Baldon Moor. You could also visit by barge but it's not that far away. After killing time, at 10am I headed towards the old mill which now houses a department store named Salt's. I don't think it's such a horrible idea as it keeps such industrial heritage sites alive and provides jobs for the nearby communities. The original complex itself was intended to have different subsidiary workshops producing things which weren't strictly related to the textile industry. What I found disappointing was the poor signage which should clearly indicate the 'visitor centre' or 'information point' at least as much as the shops and diner and more information boards, machinery, displays, etc. should be provided, not only a 10 minute video and a number of chairs. A clear information board on the former textile mill and its WH status should be present at the entrance not only a list of the shops on each floor. After my quick visit, I walked around the building towards the old mill and the most striking element was the 180ft chimney (picture) which complements what was once the largest industrial building in the world by total floor area. I decided to visit the World Heritage Site of Saltaire not because the famous Sir Titus Salt's textile mill or David Hockney's art, but to see its Victorian industrial village atmosphere by night as recommended from my friend. By the easy and frequent train connection from Leeds Station, I reached Saltaire at twilight. The first place I went to see was the Saltaire United Reformed Church, the church was quite lovely with its semi-circular portico and round tower. The twilight sky and lights from post lamps along the road to the church really set a nice spot for photographing. I continued my night walk to Sir Titus Salt's textile mill which was already closed for visitor, the mills was really looked grand and Italian which quite different with other mills I saw in Derwent Valley. 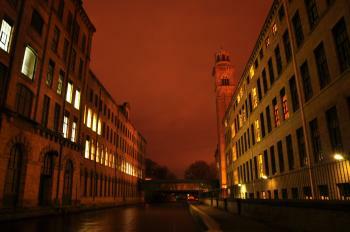 Then I walked along the Leed-Liverpoolcanal that separating the mill complex, the view of the mill from the canal was really looked great, and I really enjoyed this night view of the complex especially with the lights from inside the building. After that I walked back to Saltaire Village, I loved the thing that the village was well preserved and the lights from lamp posts were really enchanting when shining on those light yellow-grey brick buildings of once belong to mill workers. Although visiting the place by night does not provide a chance to understand overall value of Saltaire by entering into the mill or other buildings; however, Saltaire by night was better than my expectation and a nice alternative to visit this place. I went up to Saltaire on a day-trip from Manchester by train with nice wievs. I consider it worth the efforts but as James already har written, it is the total kept concept, with a large restored factory and the nearby village that makes it a heritage. The Hockney exhibition is nice but it could be anywhere, not necessesary in a WHS site. On a recent trip to Ilkley, I was fortunate to be taken to Saltaire. Not having heard of this place I did not know what to expect there. On arrival at Saltaire I was pleasantly surprised as we wandered around past Salt's Mill and surrounding houses, churches etc. I was intrigued by the magnitude of the buildings and the far sightedness of Sir Titus Salt. His employees must have been grateful for his innovations. The Mill itself was just what I imagined a mill of that era would be. 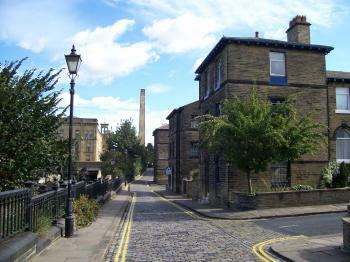 The setting of Salts mill and housing was essential to his business operations. I wonder what Sir Titus Salt would think of the pubs and inns today in the vicinity of his industrial area. Writing these comments brings back happy memories of a great day spent there with my Australian daugher and family now domiciled in London. Even the weather was pleasant for October. I would urge anyone staing in the region to pay a visit to this site. It is well worth it. I must admit that sometimes I have to really motivate myself to visit the Industrial sites on the list, after a few dull visits I wasn’t imagining this one to be much different. The website didn’t give me much hope, displaying adverts for the shops that now inhabit Salt’s Mill selling lots of expensive things that you don’t really need. However I really quite enjoyed my visit. The main site is Salt’s Mill, which is an impressive building, when it was built it was the largest factory in the world, and its on a strip of land between the railway, one of the worlds first and the hugely important Leeds-Liverpool canal give a great idea of how the industrial infrastructure at the height of the industrial revolution worked. The Mill now houses an extensive collection of David Hockney’s art, including his own paintings of Saltaire, which were nice I really liked his photomontages and opera sets. Although the rest of the mill was given over to some fancy shops it was actually interesting to walk around and you got to see the architectural details, such as the Iron frame of the building. The shops themselves were actually pretty decent and the restaurant is supposedly one of the best in the area. 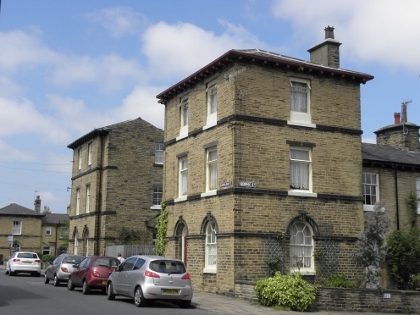 Next to the mill is the village of Saltaire, this was one of the earliest examples of housing designed for employees of large industrial factories. The average life expectancy in Bradford at the time of building was very low; 36 years old (I may be wrong). In an attempt to improve the situation the village provided very adequate housing with the latest developments such as outside toilets, to help improve sanitation. There were also a hospital, almshouses, theatre/community hall, church and parkland. This was a revolution and has an effect throughout the world on the planning of living conditions, it reminded me very much of the city I grew up in and the houses behind where I currently live are almost identical to the ones pioneered at Saltaire. They still look like very nice places to live; a little small but very nice, walking around the village reminded me a lot of the Begijnhofs in Flanders. Saltaire is a very easy place to visit as it has its own train station on the Leeds/ Bradford metro line about 20 minutes from either city. Bradford is a great place to get a curry, whilst Leeds is, I feel, one of England’s more underrated cities, and very good place to go out for some nightlife. It is also possible to visit from the magnificent cathedral city of York, 1 hour by train changing in Leeds. It is certainly worthy of its place on the list as it shows not only the great achievements of the industrial revolution but puts it in a context along with infrastructure and urban planning that have had a world wide impact. This is one of the better Industrial sites I have visited and the lovely weather made this a very rewarding visit, worth a visit even if Industrial heritage is not your usual idea of fun. 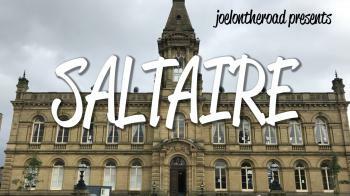 I live near to Saltaire and I think it's a great little place. The Saltaire Festival is on at the moment (6 - 16th September 2007) so it's probably a good time to visit if you want to join in with the festivities. Appart from being a beautiful place Saltaire is also a truly remarkable one. In a time that was notorious for the poor treatment of employees by mill owners Sir Titus Salt built a self contained village around his mill to house his workers. In addition to houses and streets, which are all named after members of his family, he also built churches, schools, parks, etc... today's employers should take note. 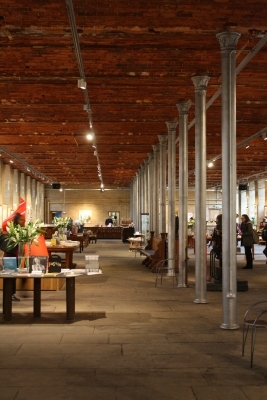 Although the houses have been in constant use since they were built the mill itself was in ruin until a few years ago but now contains shops, cafe's, business' and even art galleries (the David Hockney collection is housed in Salts mill). On a strip of land between the river Aire and the Leeds-Liverpool canal is a section of the mill that has been converted into apartments. If you walk accross the foot bridges into Roberts park there is a good view of this secondary mill across the wier. Sir Titus was a Temperate man and there are still no pubs allowed within Saltaire village. Although there are several on its boundary. Hospitals: The "Sir Titus Salt" hospital was built in 1868 as part of Salt's philanthropic vision for the town - "Salts hospital was opened in 1868 as a casualty ward for accidents in the Mill and then developed into a small hospital." It is now converted into flats (apartments). Tea Houses: Roberts Park - Half Moon Pavilion (1870) - "It was originally a Tea Room with a balcony area on its roof"
Locations for playing sport: Roberts Park. 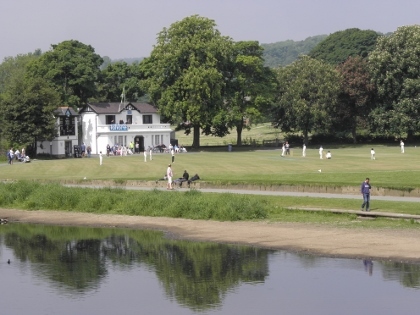 The park was a significant element in Sir Titus Salt's vision of what an "ideal" worker's village should contain and included from the start an area for playing Cricket - "Saltaire Cricket Club was founded in 1869, just 16 years after the opening of the famous Saltaire Mills in 1853. Roberts Park, a recreation area covering 14 acres and the home of the cricket club, was officially opened on July 25, 1871"
Named after individual people: Titus Salt, the town's founder.